There are some difficult driving conditions in parts of Wales on Friday after snow made an anticipated short-lived return in parts of Wales. About two inches of snow has fallen in Denbighshire, Flintshire and Wrexham. Earlier heavy snow showers fell around the heads of the Valleys, Powys and parts of Monmouthshire. More than 30 schools in Powys, parts of the south Wales valleys and north Wales have been closed. Sub-zero temperatures were also reported overnight in parts of Powys and Denbighshire. A band of sleet and snow was pushing up from south Wales after midnight but should give way to heavy rain after midday. Forecasters have warned the rain coupled with a thaw of the recent snowfall could lead to localised flooding. But the weather will clear on Saturday, with warmer temperatures. Some schools confirmed closures on Friday morning, in Powys, Blaenau Gwent, Monmouthshire, Merthyr, Torfaen, Wrexham, Conwy, Denbighshire and Flintshire. 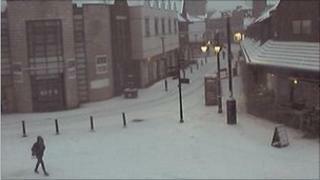 The Met Office had warned of between 8 and 12cm (3-5in) in some areas, with snow heaviest in Powys and north of the M4. On Friday morning people in Wrexham, Llangattock, near Crickhowell, and Gilewen and Abergavenny, Monmouthshire, reported that it was snowing heavily. The Llangynidr mountain road between Crickhowell and Garnlydan had a thick layer of snow and was being used only by 4x4s. The A465 heads of valleys road between Hirwaun and Glynneath was also experiencing difficult driving conditions. Heavy snow was also reported in Llangollen, Denbighshire, Llandrindod Wells, Powys, Caerphilly, Blaenffos, Pembrokeshire and Usk in Monmouthshire. Snow was also causing problems on the B4333 and B4299 between Carmarthen and Newcastle Emlyn. BBC Wales weather forecaster Derek Brockway said: "We're watching a deep area of low pressure currently out over the Atlantic but the worst of the snow should be over by midday. "It will then be followed by heavy rain washing away any snow but the showers, coupled with the recent thaw, could lead to localised flooding." Heavy rain showers are expected to spread across the country throughout the afternoon with more expected at midnight on Friday. However, Saturday presents a different picture, with much drier and brighter conditions and warmer temperatures.